A day after SC ordered Karnataka to release 6,000 cusecs to TN daily until Sept 27, all parties met in Bengaluru, and the state Cabinet was mulling options on the way ahead. In a letter written on July 6, 1915, Sir M Visweswaraya, then Diwan of Mysore and the master engineer who built the Krishna Raja Sagar dam, noted: “The whole area irrigated under the Cauvery System in Mysore at present is about 1,15,000 acres only against a corresponding area of 12,25,500 acres in Madras…”. 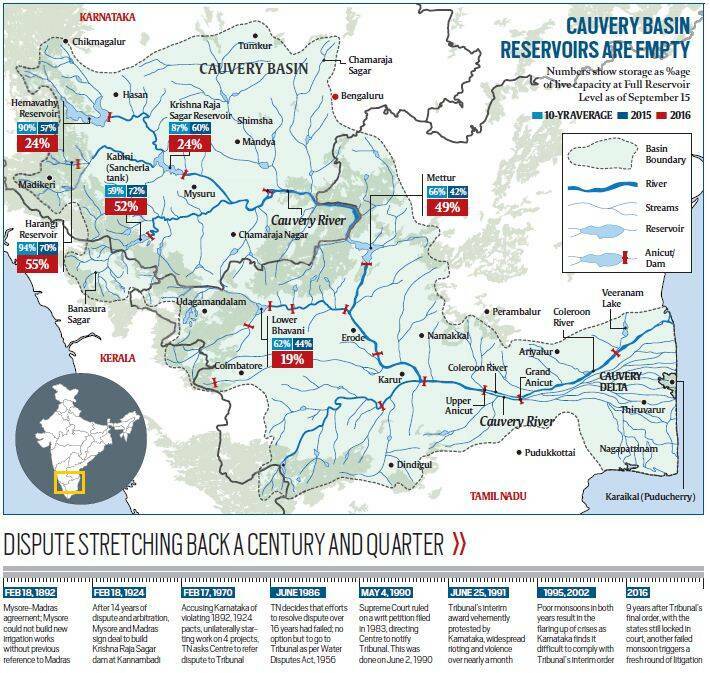 Over the years, the fact that a larger agricultural area in Tamil Nadu is dependent on the Cauvery, has played a key role in determining how the waters of the river should be split among the two states. Agriculture in the Cauvery delta region of Thanjavur and Tiruchirappalli began more than 2,000 years ago. “It is said that a Chola king constructed the Grand Anicut… which formed a great irrigation system in Thanjavur district in the first century AD,” said the Cauvery River Water Disputes Tribunal. At the turn of the present century, irrigation in the Cauvery basin in what is now Karnataka was carried out mainly through diversions of rivers, and tanks. “Since there was no reservoir, the waters of Cauvery and its tributaries like Kabini, Hemavathy, Harangi, Suvarnavathy, used to pass through the State of Mysore but their ultimate destination was the delta area of the then State of Madras,” the Tribunal said. As a result of this historical skew, TN has always had access to the lion’s share of waters — at the beginning of the 20th century, only around 138 thousand million cubic (TMC) feet out of the river’s total yield, estimated at 740 TMC ft at 50% dependability, was available to Karnataka. In 1924, when TN built the Mettur dam, the states signed an agreement allowing TN to expand irrigation by 11 lakh acres to 27 lakh acres, and Karnataka by 7 lakh acres to 10 lakh acres over the agreement’s 50-year life. Up to 1974, however, Mysore/Karnataka was able to develop only 6.824 lakh acres — a fallout, it claimed, of the unfavourable terms of the agreement. As the 50-year period ended, it set up more irrigation projects in addition to the Krishna Raja Sagar dam (1928) to use the river’s waters. The new projects gave rise to the dispute with TN over the sharing of waters, resulting eventually in the setting up of the Cauvery Water Disputes Tribunal in 1990. In its final order on February 5, 2007, the Tribunal awarded 419 TMC ft out of 740 TMC ft to Tamil Nadu, 270 TMC ft to Karnataka, 30 TMC ft to Kerala and 7 TMC ft to Pondicherry. The remaining 14 TMC ft was reserved for environmental protection and outflow to sea. Nearly 29 lakh acres of paddy crop in TN and an estimated 14 lakh acres of paddy and semi-dry crops in Karnataka are currently dependent on Cauvery water. Karnataka farmers have traditionally resented the fact that their TN counterparts grow 3 paddy crops a year while they have to be satisfied with 1 and, if there is water left in the dams after release to TN, a second, less water-intensive crop. “For the paddy farmer in Mandya (Karnataka) the agricultural season begins in June-July, ends by November. In recent years he has had only 1 crop, unlike in Tamil Nadu where 2 or 3 crops are assured every year,” said Rudrappa Gowda, a paddy farmer in Mikere village. If all goes well, Rudrappa can expect each acre of paddy to yield about Rs 30,000, but after all that he has to spend, he is left with only about Rs 5,000 for himself. “It is difficult being a farmer here. Most homes are sending children to work in the city, with only one person staying back in the village. At this rate there will be no rice farmers left in Karnataka,” he said. The Cauvey Tribunal did not sympathise with the grievance of Karnataka farmers. “It is admitted that water was being utilised by Tamil Nadu for second crop for many decades. Considering the fact that it was being utilised for second crop, we think it proper to permit Tamil Nadu to use water for second crop, if surplus water is available…,” it said in 2007. Agriculture experts have pointed to the refusal of farmers in both states to move towards cultivating less water-intensive but profitable crops even in the drier years. “Almost all irrigated areas are growing paddy. In unirrigated areas, ragi is the predominant crop. If the Kharif ragi could be grown under irrigated conditions instead of paddy, there would be saving in water without any economic detriment to the farmers…,” a Fact Finding Committee reported on the cropping pattern in Karnataka. “Further,… there is scope for intensive research and introduction of short-term varieties (of paddy),” the report said.